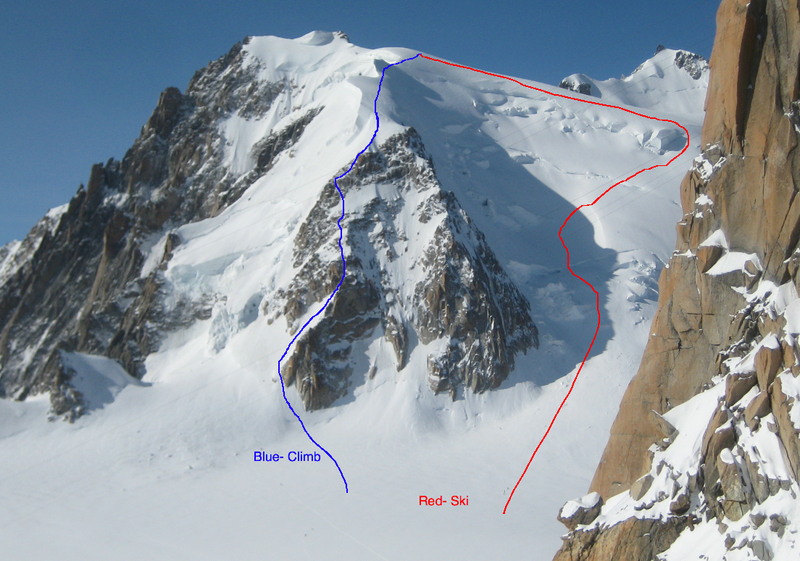 Initially I wanted to go up and climb this route on the Monday with the intention of skiing powder on the North Face of the Tacul. However when checking the webcams on Monday morning at 6:30am you could see nothing but cloud so we decided to bail on that idea looking at Tuesdays forecast we thought it would be a much better option. 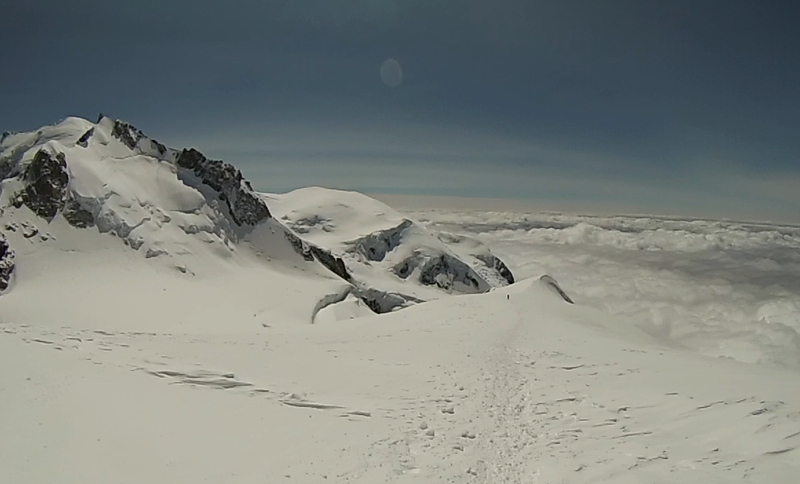 Rising early on Tuesday there was some cloud visable from the valley floor but upon viewing the webcams and seeing no cloud up high I was straight on the phone to Emily and arranged to meet at the Aiguille du Midi at 7:30. 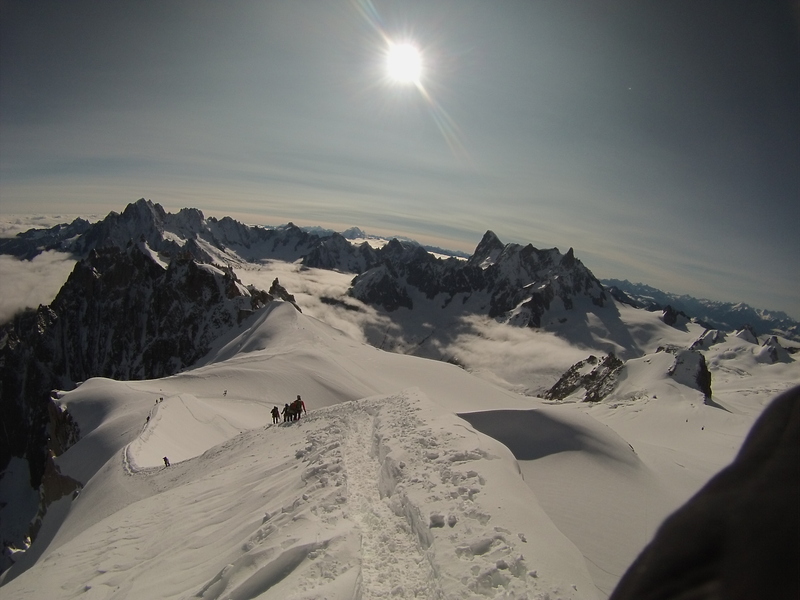 We were at the top by 8:30 after a slight delay and down the arête with our skis on by 8:45. 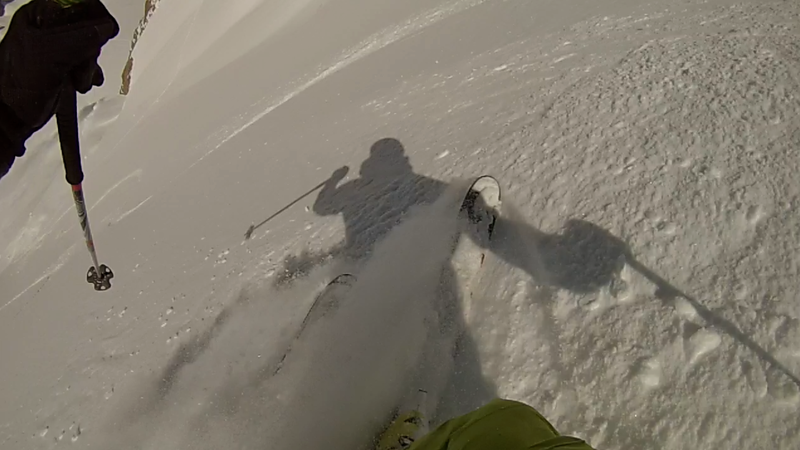 Skiing from half way down the arête we already had some nice powder turns with just over 6” of fresh snow. Skis on our feet made the approach to the base of the triangle very quick and we had our skis on our back and crampons on by 9am. The start of the Contamine-Grisolle is on the far left of the Triangle behind the lowest rock spur. To start there is a 150m 50’ slope to climb before you hit the first rock step and mixed gully. 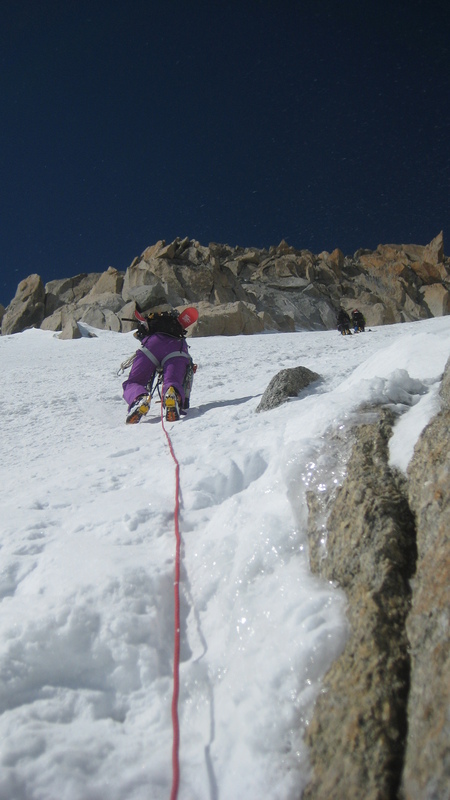 Emily climbing the lower snow slopes before the first rock step. The first mixed gully was easy to protect and we moved together up it fairly quickly, we were slower than other groups but they didn’t have 188cm planks of wood on their rucksack, which made negotiating some of the narrow trickier sections of mixed quite a delicate operation. A couple of hours in and the wind had picked up and it was really cold, struggling to keep my hands warm I was in and out of hot-aches and cursing a lot! There was a lot of mixed ground in the middle of the climb then a few snow slopes that had changed into bullet hard ice in places, which made moving very precarious and slow going. We tried to place protection as much as we could but there were some places where it was not possible so extra care had to be taken. The exit mixed gully was knackered, a combination of little or no ice and what was there would break easily or was slushy, this coupled with little protection made the last pitch take a while and we were both pretty tired by this point. Finally on to the ridgeline and a small mixed climb to the summit slopes. The wind on these exposed top slopes was blistering and we tried to make a quick pace to get some relief but the altitude and our tiredness made the last 200m very hard. As we had both summated the Tacul in previous weeks we decided to just head down without topping out as by this point it was not looking like we were going to make last bin. Above the clouds on the summit slopes to Mont-Blanc du Tacul, with Mont Maudit on the left and the Dome de Gouter ahead. We walked down the the lower ridge of the Tacul before putting our skis on as the snow was heavily wind affected and didn’t make for good skiing.Watching skiers come down the north face of the Tacul on our ascent we could see some great snow and some nice big powder turns, this is what kept us going throughout the climb. The ski down was amazing, and not just for the end of June! Nice powder and so much fresh to be had as only about 3-5 skiers had been down. 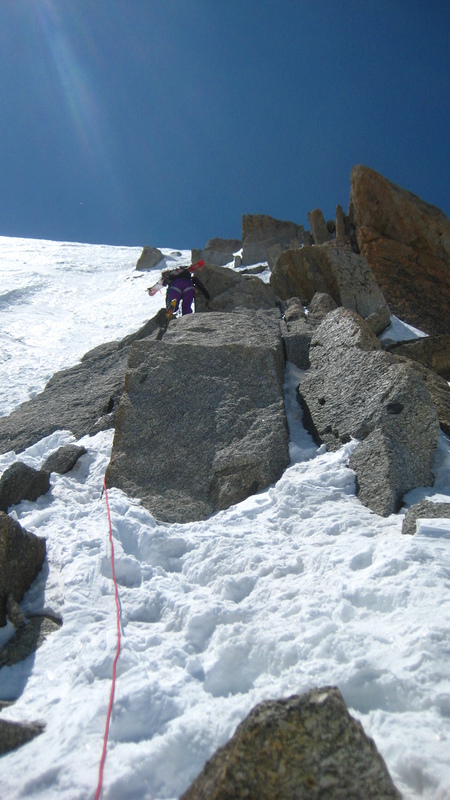 We made a quick descent of the Tacul and tried to carry as much speed as we could off the bottom so we had less walking to do back up the arête. It was hard going because of the long hard day we had but we just made it to last bin, a couple minutes late but we were on it! 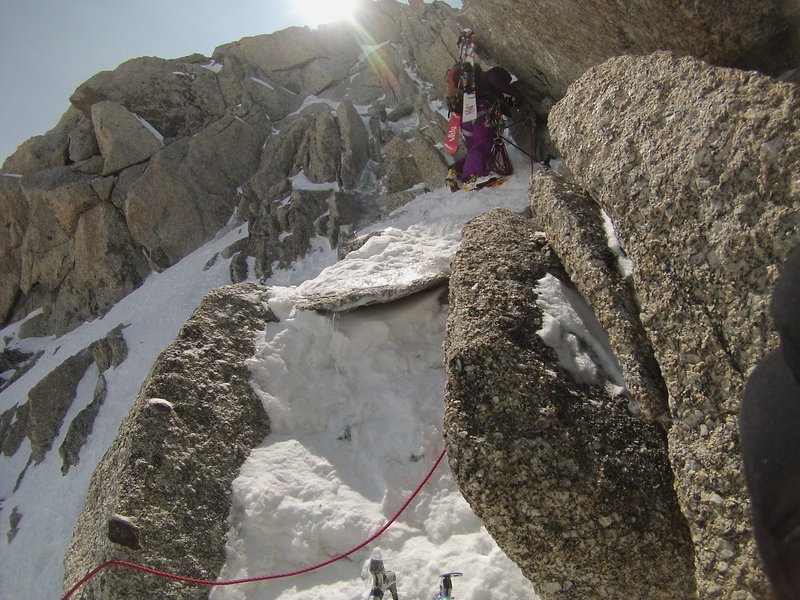 Thanks to Emily for another fantastic day Climbing and Skiing, and another Epic!